Mulch is a covering placed around plants (or covering the ground in lieu of plants), mainly to prevent the growth of weeds. But, whether placed around plants or spread out over bare soil, a garden mulch provides advantages that go beyond weed control, as will be laid out below. Crushed seashells (popular in coastal regions). Most of these materials will break down over time, helping with soil nutrition. When they break down, they add organic matter and nutrients to the soil. For this reason, one can say that they eventually serve as soil amendments. They are sometimes called "organic" mulches. Stone is the exception. It will not break down. Seashells will break down over time, but only after much time has passed, and only if you walk upon them a lot. But stone and seashells are still natural and sometimes used as mulches, which is why they are included in the list above. Be careful, though, in choosing to use stone as a mulch. Make sure that you really want it to be covering the ground in the area that you have chosen for it. This is because, once in place, stone is very hard to get rid of. If you change your mind about having it there later and try to remove it, you will find yourself having to fish a bunch of small stones out of the soil. And remember, stone does not break down into the soil, the way a bark mulch does, for example (so you may be stuck with it). Cocoa-hull mulch is one of those products that is popular for a few years, then falls out of favor, then makes a comeback, only to fall out of favor again. This roller-coaster ride is due to concerns over its being poisonous to dogs (and, potentially, to other pets). Earlier this century, much was made of this danger. Then, for a while, it became popular to say that the poison scare was a "myth." But the would-be myth-busters were not claiming that cocoa hulls were safe. They were only claiming that dogs rarely ate them. So gardeners are now starting to revisit the poison question again. What should you do? Use common sense. If you have pets and would worry about them eating cocoa-hull mulch and getting sick, just don't use cocoa hulls. There are plenty of other nice mulches to pick from. Pine needle mulch is sometimes called "pine straw," especially in the southeastern United States. Many gardeners with Eastern white pine trees in their yards rake up the pine needles that drop from those trees and use them as mulch. Long thought to add acid to the soil and lower soil pH, many experts say not to worry about this anymore. Straw and hay give a garden a wonderful, soft look and feel. They also catch and hold the raindrops during a rainstorm, which reduces spattering. When raindrops hit bare ground, they kick up soil, getting the lower leaves on your plants all dirty. Not only is this unsightly, but this spattering can bring soil-born diseases up to your plants. A layer of straw or hay prevents this from happening. Some of these materials are best used for mulching in areas of the yard where the public will not be seeing them. This is because they are not thought to be very attractive. Shredded leaves, grass clippings, wood chips, and sawdust fall into this category. But wood chips, in particular, are very useful on any paths that you may have running through wooded areas. Rubber mulch (sometimes used in playgrounds). Mulch is selected based not only on how good it looks, but also on the practical advantages that we will now consider. Reducing water loss in the soil. Regulating soil temperature (keeping it cooler in summer, warmer in winter). Improving the soil, once the mulch has broken down (in the case of the organic kinds of mulches, such as shredded leaves). Drawing beneficial worms to the garden. Keeping ornamental fruits up off the bare ground, which helps preserve an unspoiled appearance. Regarding #6, this is often important when growing hard-shell gourds and pumpkins for jack-o-lanterns. When such fruits are allowed to rest on the soil for too long, they develop blemishes. Since they are grown specifically for their beauty, you want to try to avoid this. A soft kind of mulch (such as hay or straw) is ideal for this purpose. To get the most value out of these advantages offered by mulch, be sure to use the material properly. For example, use neither too thick a layer nor too thin a layer of it. 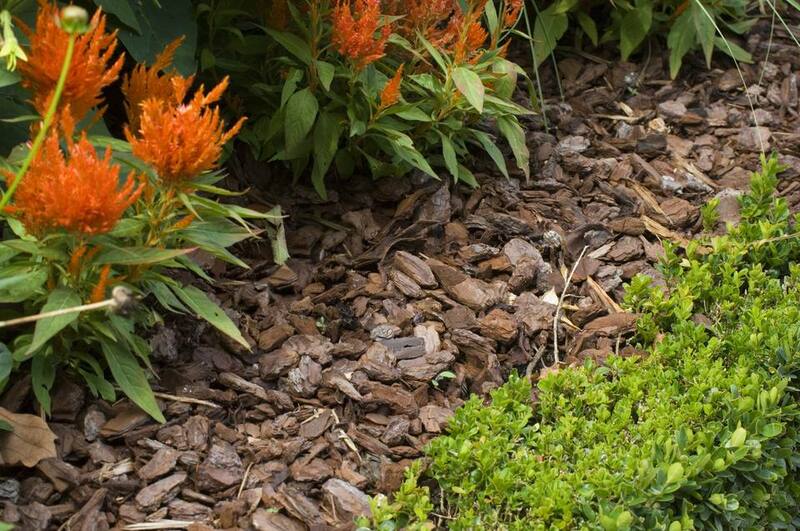 A 3-inch layer of an organic mulch is usually about the right amount to use around plants. Also, keep the mulch out at least an inch away from the base of a perennial and about a foot away from the trunk of a tree. Mulch that comes into direct contact with the base/trunk of a plant invites such problems as rot and pests.